Many World War I veterans were still very much alive when All Quiet on the Western Front, the adaptation of Erich Maria Remarque's novel was released, and I even suspect that the imagery of the battle scenes must have given more than a few fighting men nightmares. For those who did not fight, All Quiet On the Western Front might have put a damper on their belief that 'the war to end all wars' was worth all the blood and treasure spilled over it. All Quiet on the Western Front is a harrowing depiction of the brutality war inflicts on both body and soul, a tale not of courage won but innocence lost. Paul Baumer (Lew Ayres), a high school student, is swept up by war fever when his native Germany enters the First World War. With dreams of glory and a desire to fight for the fatherland, he and his classmates eagerly go from school to enlist. He and his friends go for basic training, where their former mailman Himmelstoss (John Wray) has turned into a short-tempered bully. There are some hijinks involving Himmelstoss, but then they are deemed ready to go into the front lines. At arriving at the front, the group are surprised by conditions: no food and bombed-out buildings for shelter. Under the watchful eye of Katczinsky or Kat (Louis Wolheim), they are given a simple assignment: put up wire across the trench-covered land. It isn't long before the bombs start falling, and the boys soon find themselves in the middle of a living nightmare. One of their friends, Behn (Walter Browne Rogers) is the first casualty, but it won't be the last. As the war drags on, more of Paul's friends suffer terribly. Some die, some lose their limbs. The conditions are terrible: a lot of waiting to begin fighting while in their rat-infested trench holes, with little to no food to eat; they try to live as best they can. They see battles that cost so much but gain either side so little. They see men blown to bits. They see their friends suffer physical and emotional agony, and they even see the 'enemy' suffer physical and emotional agony. And still, the war drags on. Paul, now having evolved from a naive innocent boy to a battle-hardened man and enduring a truly awful and tragic experience in No Man's Land, near the end of the film finds time with his friends for a frolic with beautiful French girls, and then a leave back home, where his ill mother (Beryl Mercer) frets over him, and his father and the elder Baumer's friends insist that he 'push on to Paris'. Paul goes back to his school, and in a brutally honest speech condemns the professor's mania for war and his encouragement for children to follow in Paul's steps. "It's dirty and painful to die for your country," he angrily tells them, "When it comes to dying for your country, it's better not to die at all!" Upset by all he sees and hears around him, he goes back to the front, to his good friend Kat, and to a final tragedy. It is now nearly one hundred years since the First World War ended, but All Quiet on the Western Front is representative of all conflict, of the physical and emotional toll the act of killing a man and seeing men, especially friends, killed takes on an individual. Through Paul's eyes and experiences, we see just how awful, how terrible, battle can be. Despite the years between the film's release and today, All Quiet on the Western Front continues to be a brutal and tragic experience because director Lewis Milestone never shrinks from making the war brutal and tragic. In one battle in what appear to be endless battles where no side ever clearly wins, we see a man putting his hands on a barbed-wire fence to try and climb over it. A bomb falls, and when the smoke clears, only hands are left, holding on to the fence. The constant barrage of battle sequences (no pun intended) doesn't numb you to the war, but puts you right there, suffering the boredom, the fear, and the pain of fighting. Milestone doesn't give us any chance to leave, so we must face the fighting and the dying just like all the other boys. That's one of the elements of All Quiet on the Western Front that makes it such a tragic yet brilliant film: all the combatants look so terribly young. It seems so tragic and unfair to see such young men die. In the middle of the film, one of Paul's classmates, Franz Kemmerick (Ben Alexander) has found himself an amputee, with no use for the beautiful boots he had since training. He allows Paul to give them to another friend, and in short order we see the boots be worn by yet two more men who die in quick succession. It's almost as if those boots were cursed, but in reality it is the unfair game of chance that decides who lives and who dies. 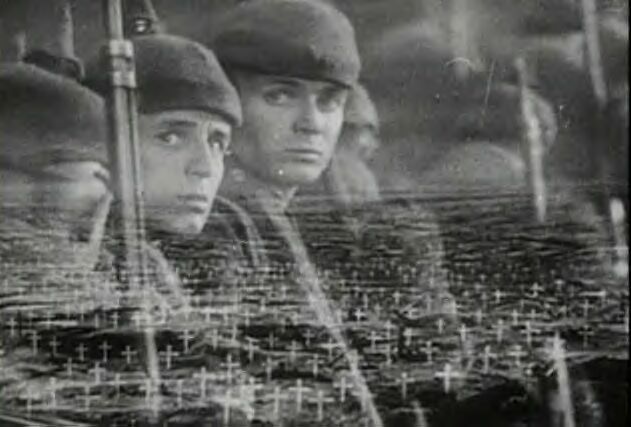 Perhaps the most brutal scene in All Quiet on the Western Front is when Paul is trapped between the two armies. To say any more about this sequence would be to give away far too much. However, every time I watch this particular scene, I always break down in tears. It is a brutal and painful and agonizing scene in a film full of brutal and painful and agonizing scenes. Paul's words become the prayer of all humanity, and at one point in this scene, when we are forced almost against our will to confront our common humanity, it becomes beyond unbearable. It would be highly tempting to cover our eyes or turn our gaze at this point, or in many in All Quiet on the Western Front, but we cannot. The production quality is too good, and George Abbott, Maxwell Anderson, and Del Andrews' script rings true to how war can destroy bodies and wreck the humanity and innocence in every man. 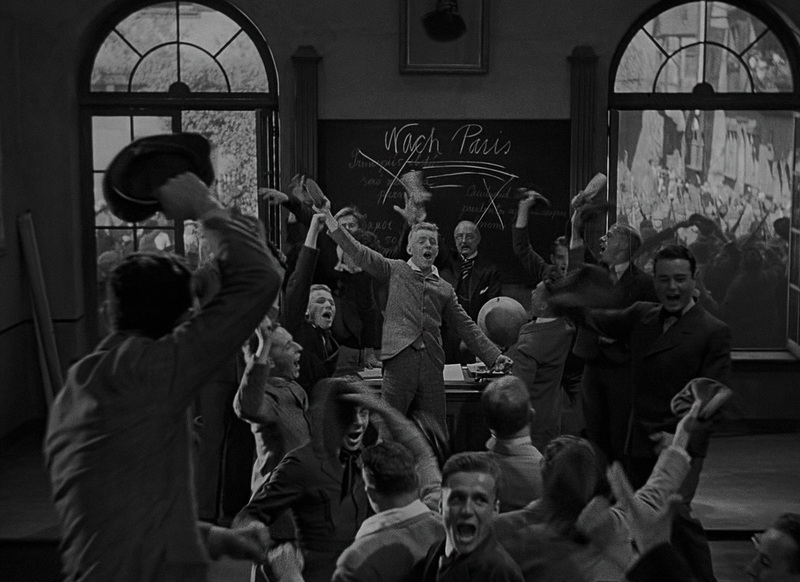 Another brilliant aspect of All Quiet on the Western Front are the performances. Even now, it boggles the mind how Lew Ayres did not receive a Best Actor nomination for his performance as Paul Baumer. Ayres, with his eager young face, shows Paul's shift from innocent to a man who was slowly devoured by war. His scene in No Man's Land, the one that always makes me break down in tears, is powerful due in part to Ayres' performance, mixing a rage with a bitter regret. Wolheim, as the cynical but caring Kat, brings a certain wisdom mixed with a genuine concern for his charges. There are actually moments of levity, and those are due to Slim Summerville's Tjaden, who is almost always hungry and not particularly bright. Though it may be my imagination, it is interesting and a brilliant move by Milestone to have all these characters sound thoroughly American, despite the fact that they are playing Germans. I like to think that be having all the soldiers sound just like our doughboys, we see that the differences between men are really superficial and irrelevant when we see the common humanity in all of us. It makes us realize that while Germany was the 'enemy', the Germans, along with the Austro-Hungarians and Turks, were and are no different from the British or Americans: both have families, friends, dreams of their own. The fact that we face the similarities between combatants but fail to appreciate them and instead kill our fellow man for trivial reasons is one part of why All Quiet on the Western Front still has the power it has. It's when we get an overt mention of how countries get into war that All Quiet on the Western Front becomes a bit too heavy-handed in its anti-war message. Our soldiers, after having the first decent meal they've had in months, speculate about why countries go to war. Their conclusion is that those in power, like the Kaiser, need a war to show how great they are. Generals need war too, to keep their positions. There's a mention of how 'manufacturers' need a war, for profits. After the First World War, the idea that the war came about because of the 'merchants of death' (war profiteers) was in vogue. I suspect that this scene was a nod to this philosophy that the Great War was caused by greed and greed alone. I find that wars are complex matters and that this scene makes it rather simplistic. "This story is neither an accusation nor a confession, and least of all an adventure, for death is not an adventure to those who stand face to face with it. It will try simply to tell of a generation of men who, even though they may have escaped its shells, were destroyed by the war..."
When I reflect on the end of All Quiet on the Western Front, I think that the haunting final image does indeed launch an accusation: it condemns us the living for allowing such horror, such evil, such terror, to have ever been caused. The dead, now silent, turn to us and metaphorically ask, 'why are we here and you there'? They speak to us from beyond, in their silence asking us and warning us that their fate may end up being our own, or that of our children. All Quiet on the Western Front is a truly great, haunting, serious film, one that long after the last veteran of "The Great War" is a dusty memory, will continue to speak to us about how hideous war is.